Russia’s Reshetnev Information Satellite Systems Company has received an order for the production of four Meridian-M military satellites as an upgraded version of Meridian spacecraft series, Company CEO Nikolai Testoyedov told TASS. 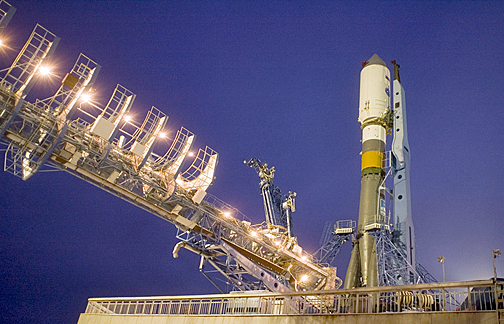 Photo of a Soyuz-2 launch vehicle with a Meridian satellite payload. Photo is courtesy of TASS. "An order has been endorsed for four Meridian-M satellites to maintain the existing orbital grouping. This is, indeed, an upgrade of existing Meridian satellites, considering the replacement of hardware components while all the technical solutions are the same," the chief executive said. The company plans to manufacture the first Meridian-M satellite in late 2018, he said. "Further on, the state customer will decide whether to launch the satellite immediately. The next satellite will be ready in 2019, the third in 2020 and the fourth in 2022," Testoyedov said, noting that the timeframe had been selected taking into account the time when the existing Meridian satellites will start to be retired in a planned manner. The Meridian series embraces second-generation satellites that came to replace Molniya and Raduga space vehicles. The operational satellites have an active service life of seven years but none of them has yet used up this term.